ROME — Europe’s leaders are carefully weighing the chances of pulling off an unusual military operation: Bombing small boats before they’re loaded up with fishermen or illegal migrants. What sounds like a hypothetical war college exercise has instead become a pressing political problem ever since one of the boats in question — operated by Libyan human traffickers — capsized in the Mediterranean, drowning more than 700 migrants. The April 18 tragedy prompted calls around Europe’s capitals to stop the traffickers, who last year sent 170,000 migrants escaping war and poverty from Libya to Italy in search of a new life in Europe. 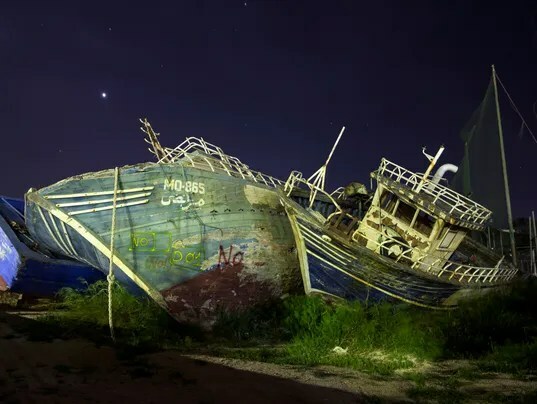 With old fishing boats often capsizing thanks to the weight of their human cargo, and old zodiac dinghies often deflating at sea, the number of migrants drowning this year alone has now topped 1,600, fast approaching the 3,400 who died on the route last year. Italian defense sources said Italian drones are already monitoring people smugglers who act undisturbed in Libya, which has collapsed into tribal feuding and lawlessness since the NATO bombing in 2011 helped oust Moammar Gadhafi. Britain and France said they planned to seek a UN Security Council resolution to take action in Libyan territorial waters, while EU foreign policy chief Federica Mogherini visited the UN on April 28 to gauge support. Observers said bombing boats would depend on hitting them after they were acquired by traffickers from local fishermen in Libya and before they were packed with migrants — a risky mission. Ban said there is “no alternative” to negotiating a political truce in Libya that would restore law and order and allow a clamp down on traffickers. Italy’s intelligence network in Libya derives from its oil interests in the country and traditional trade links. Although Italy operates only surveillance UAVs, Tricarico said the Italian Air Force trained pilots to operate armed drones and could borrow US machines for the mission. To avoid collateral damage, he recommended using precision-guided, inert munitions, that would put a hole in a boat with pinpoint accuracy, but not explode. But another former Italian military commander took the opposite view, arguing that taking out traffickers’ boats is unworkable. “However you define this, it is an act of force in a territory which is not your own,” said retired Gen. Vincenzo Camporini, the former head of the Italian military general staff and now vice president and security and defense analyst with the IAI. Camporini said the only solution is the restoration of effective government in Libya. “But that is unlikely and becoming ever more unlikely as factions continue to fight along tribal lines and a second Somalia comes into being in Libya,” he said. Camporini retired from the top job in the Italian military in 2011, just before the NATO bombing campaign against Gadhafi, which was launched when the Libyan leader took on Arab Spring-type forces in the country. May 3, 2015 in Societal.